OVNI | 1 Día de Abril. ¿Toros sí o Toros no? Home › Catalogue › 1 Día de Abril. ¿Toros sí o Toros no? Against the backdrop of the controversy surrounding bullfights in Barcelona, this satirical documentary looks at Catalan nationalism's tendency to demonise this Spanish tradition. 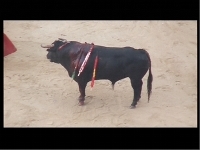 The footage was filmed on the first day of the “last” bullfighting season in the city. Six months later, the City Council presented a parliamentary proposal to ban the public use of animals for entertainment purposes.